If you’re on Ravelry.com, then you know me as ragmamarag. Beside the fact that I am a child of the 60’s and I still listen to Robbie Robertson and The Band, I also weave with rags. Mostly I use new fabric, and with my rotary cutter and cutting mat, I cut narrow strips about 1/2″ wide. With a warp of 5/2 perle cotton sett at 18 epi I weave one shot of fabric strip and then a shot of 5/2 perle cotton in a plain weave pattern. The alternating shot of 5/2 perle cotton isn’t necessary, it’s a design element that I tend to fancy because to me this additional row makes the weave pattern look more consistent, especially if you are using a busy fabric. In fact, I like to use fabric that has a lot of colors and shapes. Once the fabric is cut and compressed within the body of the weaving, the original image of the fabric resembles Pointillism, the Neo Impressionist painting technique where small distinct points of colors appear to be blended together. The fabric to the left is a colorful cotton fabric printed in Japan. 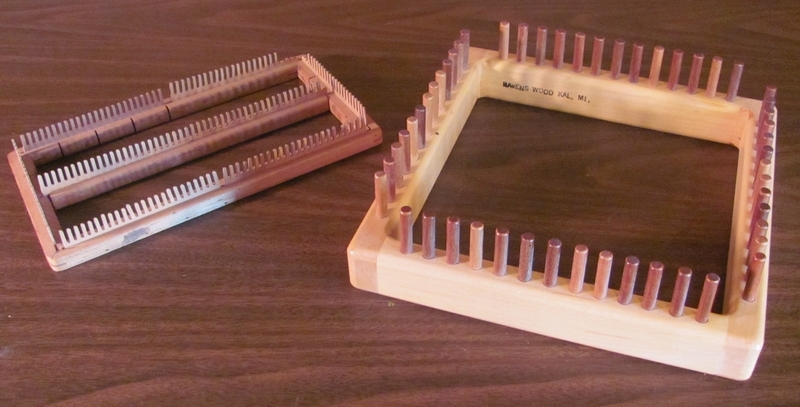 I discovered it at an assisted living facility where I was teaching a weaving class. The fabric was slated to be thrown out as its owner was no longer able to sew. I happily became its new owner! The woven sample in the photo on the right demonstrates the “pointillism” effect of this beautiful fabric. The way the narrow strips of fabric are compressed into the weaving along with the alternating rows of 5/2 perle cotton radically changes the original pattern of the fabric. My thanks to Molly my student intern from Memphis College of Art. 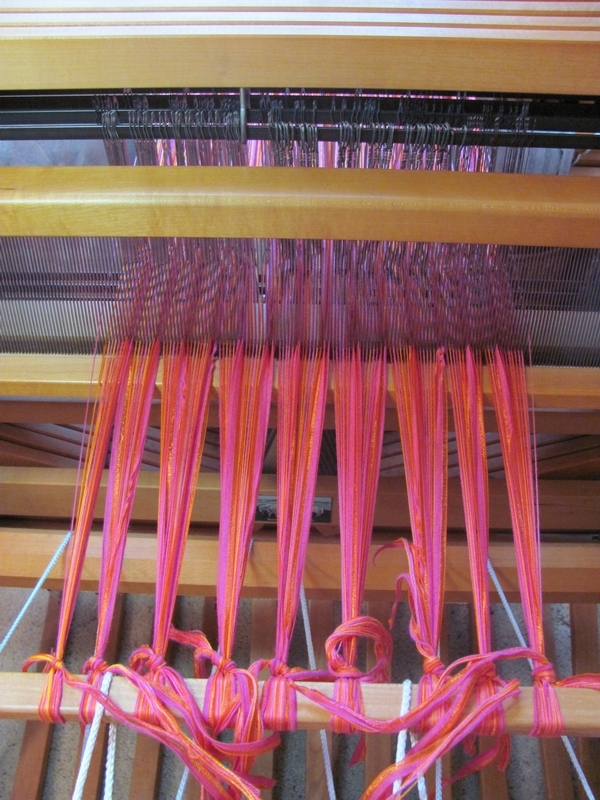 This was the first warp that Molly put on the 4-harness loom and the first sample that she wove on it. Molly’s warp was long enough so I could weave additional fabric. 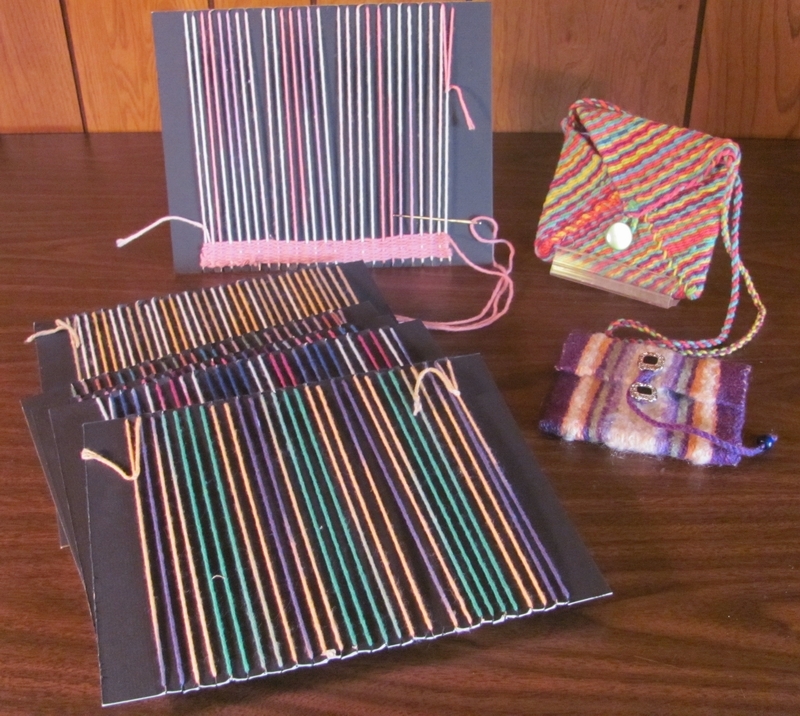 Once the handwoven fabric was finished I sewed them into purses. Each purse has a textured ceramic button with a decorative embellishment of some glass beads that were yard sale finds. Some years ago, I had written an article for Handwoven magazine describing how to weave and construct this type of rag purse. There have been many other contributors to the magazine as well who have written about variations on this bag, and Interweave Press offers some free pattens of rag purses in their “Bag of the Month” feature. 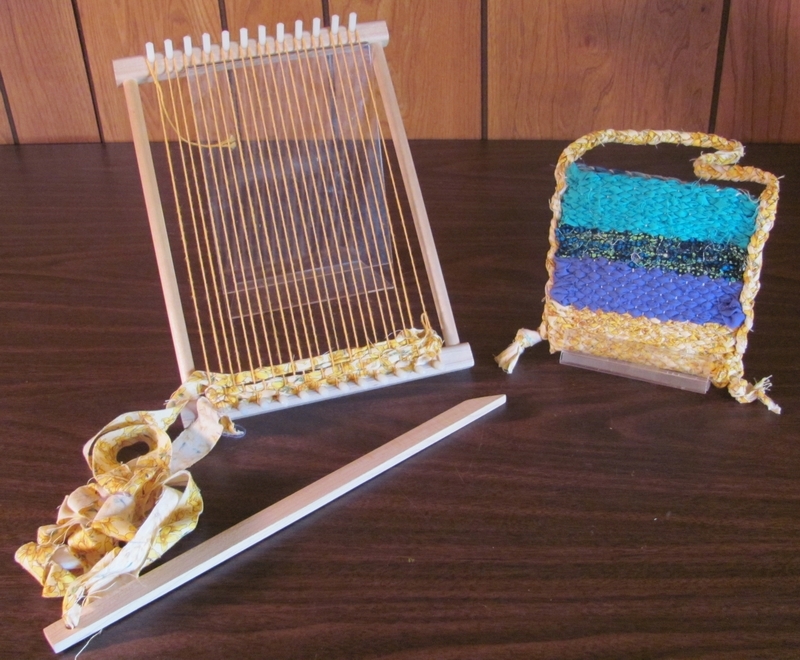 This is a great resource for weavers of all levels. The above purses will be sold in my booth, MemphisWeaver, at the upcoming Celebration of Fine Craft featuring artists from Memphis Association of Craft Artists (MACA). The fair will be held at Christian Brothers University on April 17, 18, and 19. Since the purses came from fabric and beads that were destined for the landfill, they will be sold under my “Rethreads” label which includes handwoven items made from recycled (or upcycled) material. 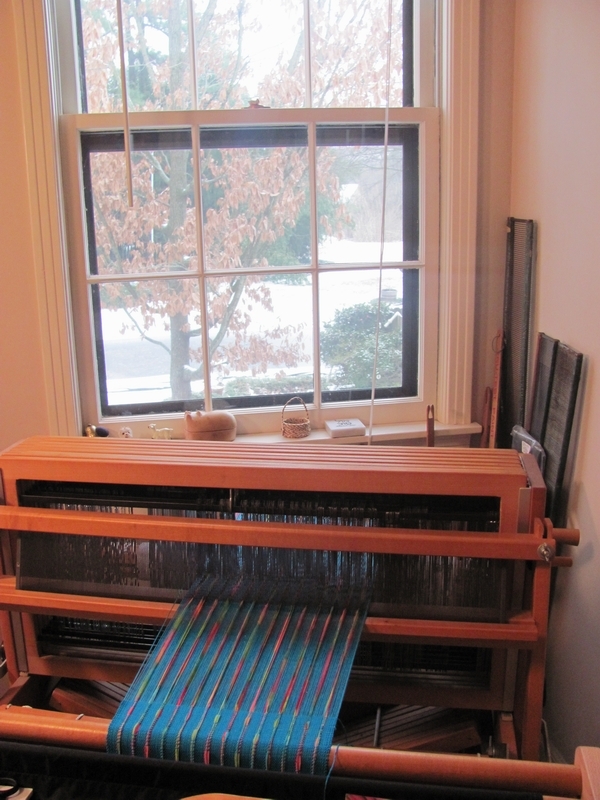 I have another warp on the loom now and hope to use up the rest of these fabric strips and plan to make more “rag bags”. I like to mix and match colors and patterns to really make a funky finished product. Each bag is pretty unique, and they look nothing like your grandmother’s rag rugs!